A mini play is just that. It’s very short, lasting between 2 and 5 minutes. There are many benefits of a mini play. They can be learned, rehearsed and performed in about 30 minutes. They are royalty free for those who purchase them. They require few props and inexpensive costumes if any. Actors get a special thrill because of their immediate success. Mini plays are great for warm-ups before rehearsals. They make terrific concert items. String a number together for an entire show. They are brilliant for school camps and as part of class lessons. These mini plays come with ideas to get started as well as follow-up activities. Most of the mini-plays have a handful of characters but many allow for extras. You can give a few groups within your group a mini play each and then have each play performed for the others in your class or company. Here are some of the themes covered in this collection of Fox mini plays. 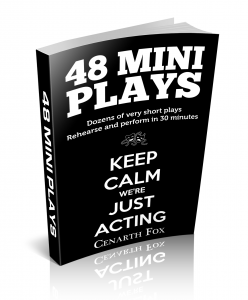 48 Mini Plays is available as a printed book and as an eBook from Fox Plays. It is available as an eBook from Amazon.